How much is Edgar Martínez Worth? Edgar Martinez Net Worth: Edgar Martinez is an American baseball player of Puerto Rican descent who has a net worth of $22.3 Million. Martinez was born on January 2, 1963 in New York City and spent his whole 18- year Major League Baseball career as a designated hitter and third baseman with the Seattle Mariners where he earned the nicknames "Gar" and "Papi". His cousin is the equally famous baseball player, Carmelo Martinez. 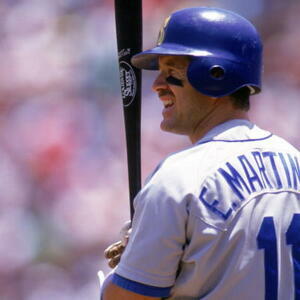 Martinez initially signed on to a minor league contract with the Seattle mariners on December 19, 1982 . He gradually worked his way up through the Mariner's minor league ranks, enjoying brief stints with the Calgary Cannons and the Chattanooga Lookouts before making his official major league introduction on September 12, 1987. In 1990, Martinez finally became a permanent fixture on the lineup of the Mariners team, after he replaced Jim Presley on third base. This was the beginning of his prestigious career as a third baseman during which he won 1992's American League batting award. He was fully designated a hitter in the 1995 season. However, just prior to the 1993 season, Martinez had the unfortunate misfortune of tearing his hamstring playing in an exhibition game at Vancouver's BC Place Stadium, and was subsequently never quite able to fully recover. Martinez is a self-taught English language speaker and computer user. He retired to the Seattle suburb of Bellevue, Washington, where he currently resides with his wife Holli, with whom he has 3 children. He was a co-founder, in 2005 of Plaza Bank, Washington State's first Hispanic bank, and has been honored on numerous occasions for the countless hours, financial support,resources and donations that he and his wife Holli have contributed to various causes including Seattle's Children's Hospital and Regional Medical Center.